They sort through the rubble of centuries to bring to light the forgotten glories of ancient civilizations. From the "Big Dig" in Jerusalem, here is an on-the-spot account of student life in their own words. Share with them the thrills and excitements, the pains and strains on site, digging up the past. TWO HUNDRED suntanned faces flash skyward to the booming, ear-shattering roar of two Israeli Phantom Jet fighters streaking away to the south. Suddenly, 3,000 years of history have become the present. This is Jerusalem, archaeological capital of the world. Here for the past three summers, students of Ambassador College have been playing a well praised part in a massive excavation of the Southern Temple Mount Wall. Under the hot summer sun, faces tan and muscles complain as traditional images of camping and the seashore are traded for picks and potsherds. A Day on the "Big Dig"
Day dawns early in Jerusalem. As I blink the drowsiness from my eyes, the first rays of the sun are just creeping over the top of the Mount of Olives. Here in the Shepherd Hotel it is 5 a.m., and 78 student alarm clocks are beginning to erupt like popcorn. The local donkey brays the start of another cloudless Jerusalem summer day. Time to be up and at it! Downstairs in the dining room Mr. Canvin, Bricket Wood's [Ambassador College – England] energetic catering manager, has ready a real "digger's breakfast" — toast and honey, yogurt, coffee, and those Middle Eastern delicacies, eggs fried in olive oil. I'm not too keen on them myself, but if I don't hurry, those ravenous roommates of mine will have devoured everything in sight. Breakfast finished, we scramble into our digging clothes — and what a sight we are. You wonder where some of the fellows and girls come up with such outfits. But after all, the Dig is hardly a place for formal wear. Outside, we are just in time to grab a seat on one of the colorful Arab buses that take us to the Dig. It is a wonder how their brightly painted, creaky open-engined chassis ever keep up with the frantic pace of this hilltop capital. In a few hectic, fun-filled moments we are outside the Dung Gate, southern entrance to Jerusalem's Old City. The doors on the buses hiss open and we pile out. Instantaneously, we are deluged by the ever-present throng of Arab children trying to coax a few coins from us in exchange for a local souvenir. But by now most of them appreciate our limited budgets and quickly turn their attentions to a potentially more receptive group of tourists across the road. One or two of the friendlier youngsters stay back for a ride on our backs up the hill and through the gate. Inside on the right is the Dig. On site, no one has to tell us when we reach the work area. The ground is covered with a layer of incredibly fine, powdery gray dust. It boils up around our ankles with every step. At first we watched it with curiosity to see the fascinating patterns it made. Now it is just there. Up ahead, standing amidst the long rows of tools, is the strong-bodied figure of Vasili, our foreman. He is a young Greek archaeologist who has been working in Israel for the past five years. About two hundred young people work on the Dig: 78 are from Ambassador College, the rest, volunteers from around the world. Each is a part of a small work team of half a dozen or so. Each team has a leader whose job it is to set the pace and keep the heavier jobs from the girls. I'm over one of the groups myself. Vasili is over us all. The job we do is as simple as the tools we use — picks, shovels, trowel, brushes, wheelbarrows, and rubber buckets. The rubber bucket is a standard feature on archaeological sites as it is comparatively harmless when tossed down a deep pit. It is the main container for moving materials. We are literally expected to move mountains barehanded. Many first-time observers on an archaeological excavation wonder how much of the dirt and rubble is moved manually. Virtually every ounce has to be removed by hand. Otherwise, countless important small artifacts would be Lost or destroyed. We have a bulldozer on the Dig which has, in fact, just grunted into action with a puff of black smoke and a throaty growl. But it never gets near any of the important areas. Its noisy presence on the Dig, although not very welcomed by the diggers because of the clouds of the powdery gray dust it ceaselessly covers us with, is a powerful "strong arm" for clearing noncritical fill and for moving sifted rubble. Down in the holes digging is under way. In each of the areas some wield the picks and shovels. Behind them others fill the rubber buckets with the material dug free. Still others use brushes and small trowels to clean the building stones. As each full bucket is tossed or hoisted to the top, it is dumped into a rectangular sifting frame fitted over a wheelbarrow. After a vigorous shaking, eager hands search the remains for the occasional intact pottery handle, the glint of a piece of glass or the telltale blue-green colour of a corroded coin. Finding such long-lost artifacts generates a sense of excitement and provides the information the experts need in dating the layers through which we dig. As for me here in the sunshine, it is hot — mighty hot! By now the pick I am swinging seems welded to my hands. The deeper I dig, the more rocks it seems to hit. Besides this, my back aches. In fact, all my muscles ache. I never knew I had so many. As I straighten up for a moment, someone rumbles past our pit with a wheelbarrow full of rubble and I get a face full of dust. I blink and look around. Towering above me in the cloudless blue sky is the glistening dome of A1 Aksa Mosque. Just now one of the colony of pigeons that inhabits the Wall glides toward me in the warm breeze. Then it turns and returns to its precarious perch high above the sundrenched Dig. Just over my right shoulder rises the Mount of Olives. It is so close I can see a busload of tourists arriving at the Intercontinental Hotel — that familiar landmark on the Mount. To my left, in characteristic medieval style, is the old Crusader and Turkish Wall. It still surrounds most of the Old City. It begins its serpentine course immediately in front of me, where it joins the magnificent golden-stoned southern face of the Herodian temple wall. Behind me, my thoughts fall on the historic Valley of Jehoshaphat curving away to the south to meet the Tyropoeon Valley and the Valley of Hinnom — the ancient "hell" (gehenna) of the Bible. Momentarily, I remember, "I'm in Jerusalem." Chariots and Roman Legions flash through my mind. The throne of David was only yards from where I am now standing on the Ophel Ridge. I can't help contrasting my mind's — eye image to the potpourri of tumbled-down, little box dwellings that now clutter this historic site. Suddenly, I am brought back to reality by a stinging sensation. A drop of perspiration has trickled down my dusty forehead to find its way into the corner of my eye. I wipe my grimy face on the shoulder of my dusty shirt and get back to work. Digging from seven in the morning until one in the afternoon seemed like an eternity the first few sunburned days. But now time goes quickly. The 10 o'clock break helps a lot. We gather like pigeons on the ancient Byzantine walls outside the Dig office to wait for Mr. Canvin. In his familiar little white VoIkswagen van, he comes over the hill and through the gate in a cloud of dust, laden with all kinds of "goodies." Out comes the lemonade, the yogurt and the sandwiches, all prepared by the girls on kitchen duty this morning. That half an hour in the shade, sharing the morning's experiences and showing the girls (at close range, of course) a local reptilian we managed to catch during the morning's work, is tremendous. It is not only a time of rest, but one of companionship. But now it is 10:30 and time to get back to work. Two and a half hours to go. In our area of the Dig outside the Crusader and Turkish Wall, along the southern face of the Temple Mount, the main job is the removal of general debris. The entire Dig area is "L" shaped, five acres in extent, and encompasses the entire Southern Wall and its southwest corner. The Crusader and Turkish Wall to my left divides the area virtually in two. During the first two summers of the Dig, all the work took place inside the Wall. But this summer most of the activity has moved outside the Wall. A few weeks ago the ground here was nothing more than a bramble-covered slope falling away to the south. Today it is busier than an agitated anthill. Each day we are finding new buildings, new cisterns, new water channels, new pavements, and very recently we came across a magnificent Herodian staircase built shortly before the time of Jesus. It led up in grand style to the famous "Hulda Double Gates" to the Temple Mount. 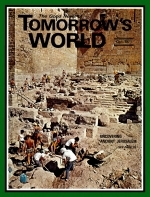 Professor Mazar was excited by the find, and the Jerusalem Post, Jerusalem's English newspaper, ran a substantial feature story on the discovery. But just now, running up the hill shouting is Vasili. He is hot on the trail of a group of wide-eyed, camera-toting tourists who have somehow evaded the guards on the gate. Security on the Dig is a constant headache here in the center of tourist-filled Jerusalem. Were it not for the hawk eyes and stern faces of the men on the gates, there would be standing room only. Vasili, with much gesticulation and persuasion, now has them cornered and is leading them to the gate. Down in my pit I have uncovered a big rock. It has been here for centuries, covered with the dust of passing civilizations — Jewish, Roman, Turkish and Crusader. And I am now determined to move it. It is a real challenge. So I lift my pick and bring it down with a thud. The pick wedges itself under the corner of the rock — and the rock moves. I want to know what is under it. What will I find? Probably the usual dirt, broken pottery and more rocks. But at the back of my mind run expectations of something more exciting. Maybe a silver shekel from the first century? Or a glass figurine of a later period? How about a decorative marble image of a lion from the time of King Herod himself? Or perhaps a stone with the seal of the Roman 10th Legion? These are not wishful guesses. In the last two weeks Ambassador students have found these very remnants of the past. Yesterday, one of the girls found a well-preserved oil lamp dating from about the 6th century B.C. ; another, a fascinating weight inscribed with an unusual Greek inscription. It is this thrill of discovery that pushes us on. It is hard work, but it is rewarding. It is now a few minutes before noon. Strange sounds begin cascading from the slender Moslem minaret towering above our heads. The sounds are strange to our Western ears, but we have come to look forward to this auditory interruption of our dusty routine. It signals a ten-minute break — a cold drink and a chance to play with Antiochus, a frisky little puppy belonging to one of the Dig leaders. Only one hour left. The hottest one of the day. By the time we finish our day, we will be walking piles of dust and dirt, covered from head to toe and distinguishable only by the bright red or blue of our Israeli "shalom" hats. Ah — that cool shower awaiting us back at the hotel ! But beyond the bright-colored hats, the wheelbarrows and the rubber buckets, the work of these 78 energetic students who have come this summer to dig in Jerusalem is of vital importance to the worldwide work of Ambassador College. In their sometimes comical attire, doing their "down-to-earth" jobs on the Dig, they might seem to be just another group of young people come to seek a unique summer far away from home. But to the men who direct this important academic project in Jerusalem, Ambassador College students are certainly not "ordinary." Meir Ben-Dov, Professor Mazar's right-hand man, mentioned recently with a clear ring of seriousness, that next year he wanted 250 Ambassador College students. What a fitting tribute to the important and valuable work being done by the students of Ambassador College here in Jerusalem.